To commemorate the death of Sergeant William James Curtis DCM. killed by shrapnel on May 18th 1918. He is buried in Cambrin Military Cemetery, Pas de Calais. Also in memory of John Curtis, one time bellringer at St John's who died today Sunday 13th May 2018. He was a relative of William James Curtis, in whose memory this quarter peal was originally arranged. 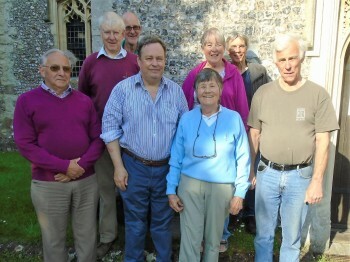 The band (L to R) Front: Rodney, Roger, Elizabeth, John D. Rear: Bruce, John C, Wendy, Ian. Last updated Sunday, 13 May 2018 at 21:02:49. First submitted Sunday, 13 May 2018 at 19:07:48 by Roger Booth. Sent for publication in The Ringing World on Sunday, 27 May 2018 at 19:18:46, and printed in issue 5590.